We are incredibly lucky at the museum to have stories from a myriad of different people who lived, worked or visited the valley over the past 100 years. Most of the narratives from the era of Alta Lake tend to belong in one of two categories: summer resort life or logging and railroad work. The same names are often mentioned in both, as would be expected in such a small community, but very few people really lived in both categories. One exception is Verner Lundstrom. In the late 1920s, at the age of 18, Verner left Sweden to join his brother Charlie at Alta Lake. Charlie had arrived in 1927 and made his living as a logger and pole cutter, finding the tall, straight cedars that could be used as telephone poles. The brothers lived in a cabin close tot he railway and near Fitzsimmons Creek, about a mile away from Lost Lake. Together they logged cedar poles around the northeast area of Alta Lake. Verner Lundstrom hard at work. Photo: Lundstrom Collection. As Verner recalled in an oral history done in 1992, all of their work was done by hand. With no power saw, trees were usually felled using a two-person saw. The brothers used horses to help move the poles to the eastern shore of the lake by what Verner described as “skid roads”. From there the poles were floated across Alta Lake to the railway station at the south end and loaded onto flatcars. Verner and Charlie worked together for 8 to 10 years before Charlie moved on. During that time there were various logging operations within the area and Verner knew many of the people we’ve written about before, including the Jardine-Neiland family, the Barrs, Denis DeBeck, B.C. Keeley, the Gebharts and the Woods family. Life in Alta Lake wasn’t all work – here Alf Gebhart poses with Ben Dyke and an unknown woman in front of his house at Parkhurst. Photo: Debeck Collection. In his first few years at Alta Lake, Verner also worked at Rainbow Lodge as a seasonal handyman and experienced life centred on summer tourism as well. Verner recalled that, at the time, Rainbow Lodge would have up to 120 guests and he and some others spent a lot of time swimming during the day and dancing at night. For Verner, who enjoyed swimming and hiking, his job at Rainbow Lodge sounds ideal. With the mountains and lake nearby, working at Rainbow Lodge was ideal in the summers. Photo: Philip Collection. When Verner wasn’t working at Rainbow Lodge or cutting poles with Charlie, he and his brother would often head up the surround mountains. Verner thinks they must have gone up Whistler Mountain “hundreds of times,” either to hunt or “just to walk up to the lake.” The lake in questions, Cheakamus Lake, had an old cabin that had been used by trappers and many weekends Verner would hike up, with or without Charlie. 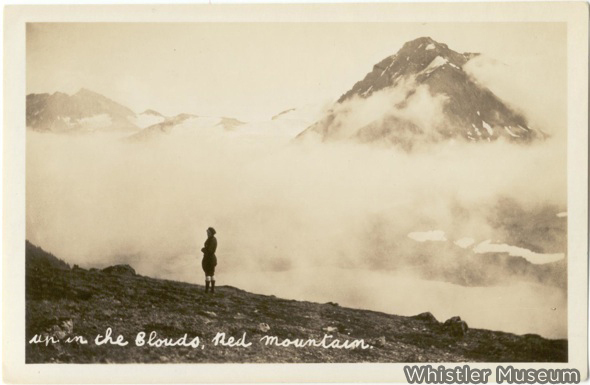 Though Verner didn’t recall hiking up Blackcomb or Wedge, he did remember time spent hiking up Sproat and Red Mountain, known today as Fissile. Verner stayed in the area even after Charlie had moved on. In 1942, when he married Lauretta Arnold, Verner was living further up the rail line at Mile 43 between Alta Lake and Pemberton. The couple then moved up to Mile 48 where Vern did the logging for the sawmill of John Brunzen and Denis DeBeck. After their first child, Verner and Laurette moved to Birken, then later to Pemberton where their daughters could attend school. In 1950 the family left the Sea to Sky and moved to Chilliwack where Verner continued to work in logging camps. Even after he retired, Verner continued to fell trees for his friends until the age of 85. Like Verner’s story, each oral history, letter or memoir in our collection provides a unique perspective on life in the valley. Having access to so many different memories allows us to form a more complete picture of Whistler’s past. Come visit us at the museum if you’re interested in adding your own perspective to the mix. Trick Question: Ever been to Red Mountain? Most would agree that the physical landscape has played as much a role in our region’s history as the people, so we figured we’d give Mother Nature her due by profiling some of the amazing natural features and landmarks surrounding Whistler. As with any history, it’s easiest to start at the beginning, so it only makes sense to go way back and profile the oldest thing in Whistler, Fissile Mountain. Beginning over 200 million years ago sediment deposited in a large basin that was forming between the west coast of North America and smaller tectonic plates incoming from the Pacific. The ensuing tectonic clash created the Coast Mountains and left much of the ancient sediment basin covered with younger rock. Fissile Mountain is our region’s notable exception, as it’s steep slopes of rotten shale and sandstone are actually a persistent exposure of this ancient sedimentary rock. For tens of millions of years now, Fissile has weathered stoically all the while witnessing the creation and growth of surrounding, much younger peaks. Fissile Mountain is full of character. 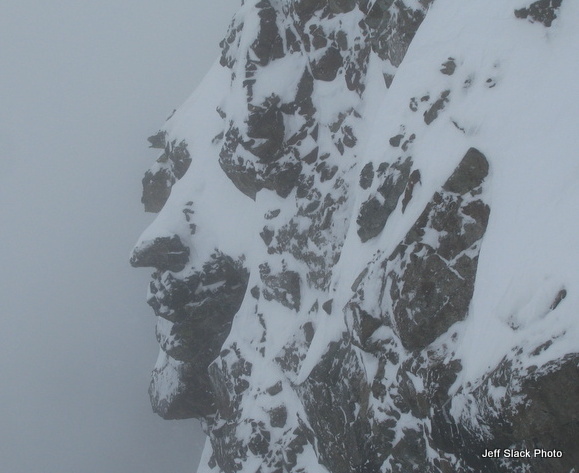 This rock face can be found between the Banana Couloir and the Northwest Face. Myrtle Philip takes in the sublime setting at “Red Mountain,” 1928. William “Mac” MacDermott photo. For a long time we weren’t sure whether “Red Mountain” was today’s Fissile or it’s neighbour Overlord, both are in the same general area and composed of rotten, rust-coloured rock, but one of Neal Carter’s old climbing photos fully convinced us it was Fissile. 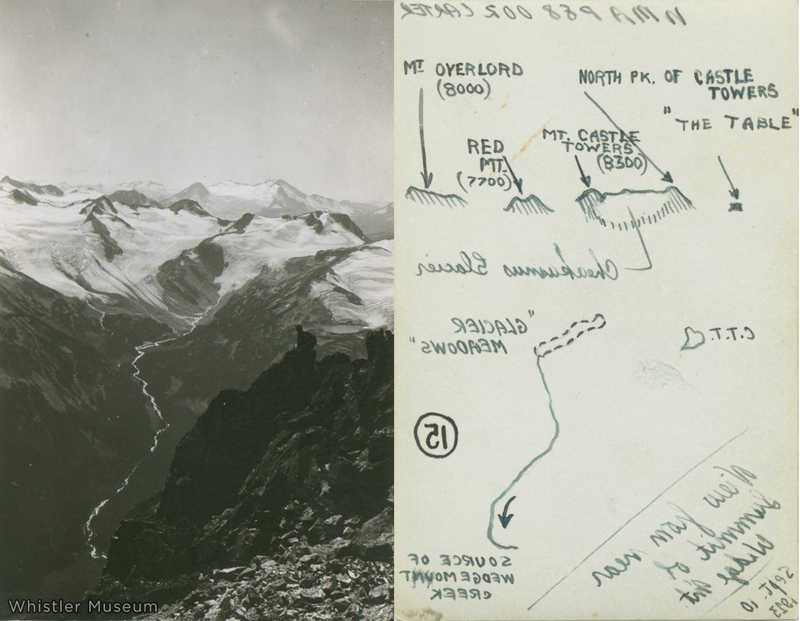 Shown below, the annotations on the backside of this 1923 Neal Carter photograph, which looks south from the near the summit of Wedge Mountain, clearly identified Fissile (only the top of which is visible) as “Red Mountain” while identifying Overlord as well. Note how the foreground peaks and glaciers (the Blackcomb backcountry, including Mount Pattison, Mount Trorey, and Mount Decker) are unidentified because at this time they were still unclimbed and unnamed. Neal Carter’s 1923 photograph. The digital scan of the backside of the print has been reversed. Carter actually wrote the mountain annotations backwards. If you hold the original print up to a light, they can be seen through the image, appearing the right way around, pointing to their respective peaks. All the other writing (that which appears backwards here) doesn’t really show through the darker parts of the image. “C.T.T.” (backwards) refers to Charles T. Townsend, Carter’s climbing partner who is visible in the right-hand foreground. Red Mountain received its current name in 1965, based on a suggestion from the Fitzsimmons Names Committee, which consisted of local mountain-lover Karl Ricker, and interestingly enough, Neal Carter. “Fissile” is an adjective used by geologists for rocks that split easily, which will make sense to anyone who has ever slipped and skidded up (or down!) the loose, sharp rocks which cover Fissile’s flanks. In 1968, the British Columbia Mountaineering Club, led by local climbing veteran Werner Himmelsbach, built a small backcountry hut at the base of Fissile beside Russett Lake. Now known as the Himmelsbach Hut and administered by BC Parks, the compact, sturdy, and easy-assembly Gothic Arch design has been replicated with several other backcountry huts throughout the Coast Mountains. In ensuing years the area grew in renown as a summer hiking and climbing area (the rotten rock isn’t pleasant to climb, but the north-facing snow and ice routes stay in great shape all summer long). 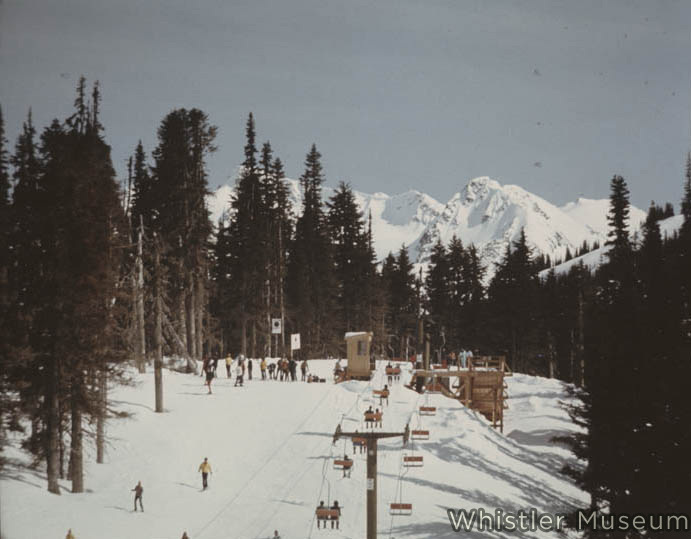 With the rapid growth of Whistler Mountain, and major advancements in ski technique and equipment, it wasn’t long before skiers followed suit. Many pioneers have been forgotten with the passage of time, but John Baldwin’s “Whistler Backcountry” map credits Jim Vaillancourt with the Saddle Chute’s first descent way back in 1980, and the imposing Northeast Face route was first skied by the prolific skiing/climbing duo of Jia Condon and Rich Prohaska in 1990. This is why Fissile is such a favourite among backcountry skiers. Fissile is undoubtedly one of Whistler’s most iconic peaks. 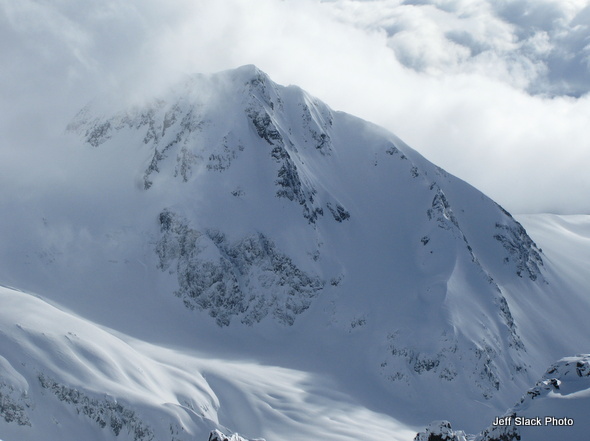 Even if you’ve never skied or climbed its flanks it has probably left an impression on you, as the jagged pyramid is plainly visible from all over the ski resort. Fissile dominates the view from many points within Whistler-Blackcomb, including here at the top of the old Orange Chair. George Benjamin photo. 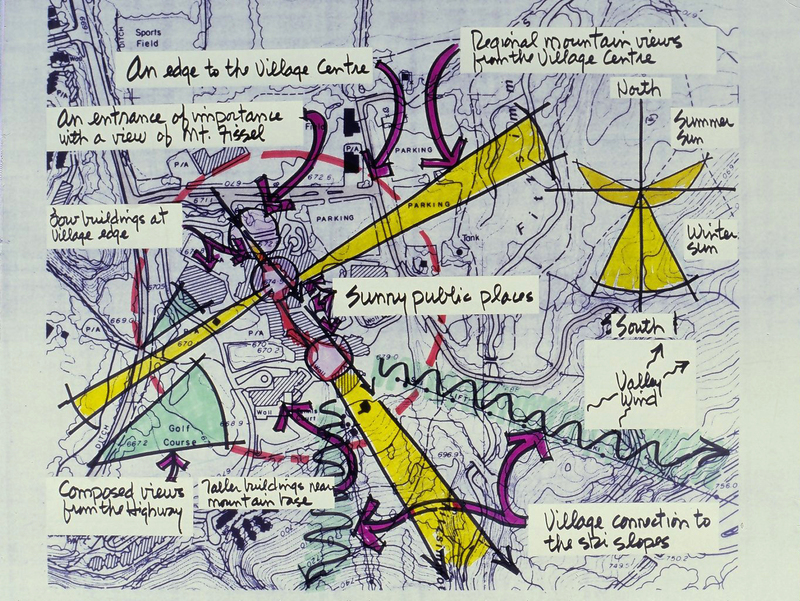 It’s visual impact is so strong that when Eldon Beck first began conceiving the layout for Whistler Village in the late 1970s, his starting point was the Village Gate entrance, which he designed specifically so that Fissile would be visible to greet incoming tourists. On one of Beck’s original drawings held in our archives, he even labelled “an entrance of importance with a view of Mt. Fissel [sic].” (For more on the design of Whistler Village, check this post.) Inspired viewscapes such as this have shaped the experiences of countless visitors to Whistler over the years, and convinced more than a few of us to stay. How about you? Do you have any interesting Fissile stories? What is your favourite local peak?